The laboratory and administration building, now called Lumen, is located in the north of the university city of Wageningen, close to other existing agricultural institutes. The design brief was for a functional, user-friendly research facility working in harmony with nature; versatile and ecologically sound. 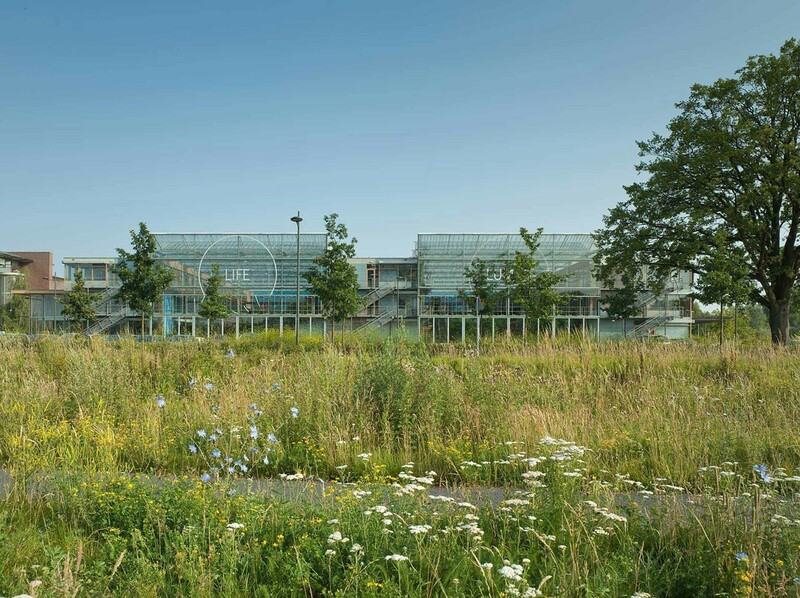 The building was designed not to dominate its rural setting, but to embrace the landscape, with all workplaces in direct contact with indoor and outdoor gardens. Two indoor gardens provide the focus for daily activities and function as informal meeting areas. Beyond this, they are an integral compo­nent of the building’s energy concept, improving the performance of the external envelope. This EU pilot project for ecological construction incorporates progressive ideas from both the client and user groups, creating a multi-layered framework that is capable of responding to the multitude of demands in such a research establishment. The design’s deliberate aesthetic imperfection is an appeal to an unmediated, primarily sensory experience of architecture. The project was realised within a standard budget demonstrating that durable and sustainable building techniques can be applied without additional costs. 11.800 qm / 126,970 sq.ft. 70.000 cbm / 2,471,700 cu.ft.